Some trees with sunlight on them? Some hills in the background? Perspective matters. Being able to stand apart and survey the landscape matters. Being able to make sense of differing perceptions of reality matters. Here are a few suggestions for gaining perspective in a time of dramatic, disruptive change. 1. No one sees the whole picture. Therefore we need to read and converse broadly. Just as our networks need to be diverse and widely dispersed, so should our sources of information. No one has the whole story that we need for understanding what is going on around us. Ultimately, we are responsible for developing our own perspective. 2. Background is bias. Everyone’s past history impacts their perspective. It can blind them or prejudice them to a more balanced perspective. To the best you can, know the historical and cultural background of the people you look to for information and insight. Be a good critic of those of us who present our opinions to the world. 3. Expert knowledge is not what it used to be. Just because someone has spent their career in a specialized area doesn’t mean that their insight is relevant. Increasingly, value comes from linking different perspectives and sources of information to create a perspective that takes in a broader range of considerations. When a person can place their specialized knowledge into a larger perspective, then their insights begin to have value. 4. Knowing what you don’t know is more important than what you do. As human beings, we like to feel comfortable and secure. This is certainly true about our knowledge and perceptions. The reality is that none of us know enough to be totally secure in knowing every thing we need to know. It is important therefore that we develop networks of people who have different areas of knowledge for us to draw upon. Knowledge is no longer a skill of acquiring encyclopedic knowledge. Instead, developing the skills for networking and investigation are the essential tools for acquiring the knowledge we need to make good decisions. 5. Context matters more and more. And context is determined by the various social networks that we are connecting with each day.One set of contexts are our families, our workplace, our community and the friends, acquaintances and colleagues that we see socially. Another set of contexts is ideological and structural. If you are a social conservative or politically progressive, you are in an ideological context that establishes a fixed perspective for interpreting what is happening. For example, if you listen to Rush Limbaugh or read the Huffington Post, your are functioning within a defined, albeit narrow, ideological context. Our ideological perspective can act to filter out the information that challenges guiding assumptions and perceptions. It acts just like a closed social network does to maintain group integrity. It also limits access to new ideas. The challenge, therefore, is to have a clear set of values that guide how we interpret the information and opinions that we receive. If you work in a large corporate environment, your perspective is different than if you are a small business owner. If you work in a technology company, your perception of how business works is different that if you work in a local community non-profit. Everyone of us has our perspective formed by the contexts where we live and work. By recognizing this, we allow ourselves to become more open to differing perspectives so that we can gain a larger picture of what is happening around us. In addition, the safe assumption is that until proven otherwise, everyone has an agenda that may or may not be evident in what they are presenting as relevant information. Be a good critic and if something sounds too good to be true or too judgmental or unfair, then it is probably driven by an agenda which prejudices and restricts perspective rather than opens it. 6. There are no final conclusions. Every perspective and perception is subject to modification. We should remain open to greater clarification and insight. This doesn’t mean we never have formed opinions or reach definitive conclusions. Rather, we are constantly testing our beliefs against an expanding perception of what is really going on. As a result, knowing our own values and what is important to us is essential if we are to be good judges of what we hear and see. When we gain a broader perspective, we can step back and see what is before us in a much larger context. 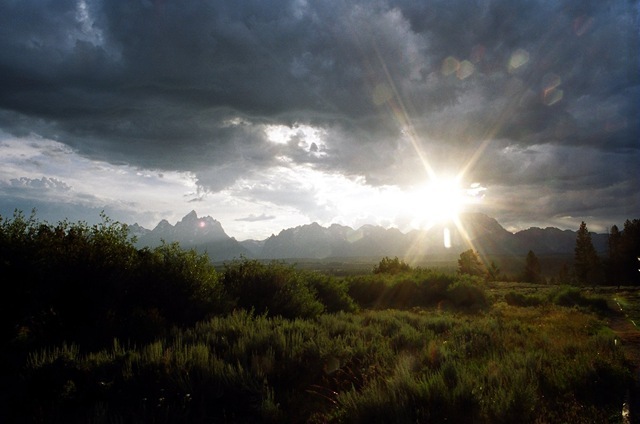 As in this picture of the Grand Tetons in Jackson Hole, Wyoming. The trees and scrub in the foreground as shown in the picture above are not the whole story of this picture. 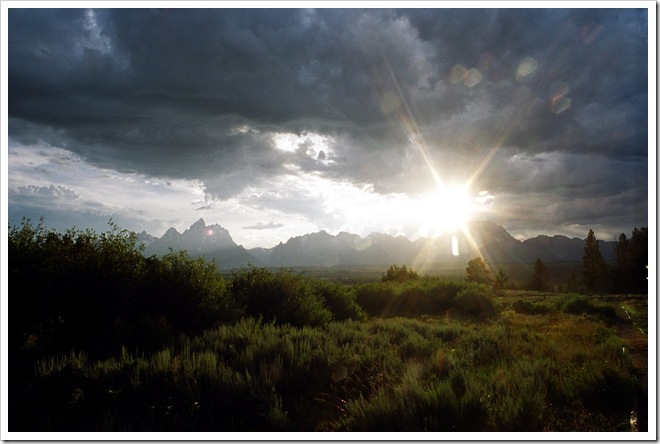 Instead, it is a small facet of a picture of dramatic storm clouds hovering over a sillouette of the mountains. So too, our perception of what is happening around us. When we see what is right before us and what is coming in the distance, then a more beautiful, realistic vista of the future can be seen. Tagged with context, decision-making, knowledge, Opinion, perception, perspective.